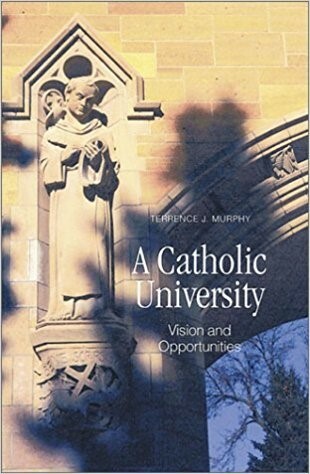 A Catholic University: Vision and Opportunities What is the nature of a university? What is the role of religion in the life of the university? What is a Catholic university? In A Catholic University, Msgr. Terrence J. Murphy addresses these fundamental questions by taking an in-depth look at the University of St. Thomas in St. Paul/Minneapolis, where he serves as chancellor. He identifies what makes a university a Catholic university and demonstrates how Catholicism can be an integral driving force of the university. Murphy shows how religious values and commitment to the community, under entrepreneurial leadership, play out in specific academic programs and how they can change and give new energy and outreach to the university and its community. He emphasizes the importance of religious commitment within a university's mission. Religion as it influences the education of young people can build better people and communities. Religion as related to the marketplace, if taken seriously, can energize a university to greater service to the community and can become an agent for good in the marketplace and the public square. A Catholic University also addresses societal concerns by sketching out how this one university has tried to be a responsive and constructive citizen. Its experience is of value to educators, to parents of college students, to supporters and friends of education, and to informed citizens. Chapters in Section I: Catholic Higher Education for a Fuller Life are "Education, Religion, Leadership," "St. Thomas-The Little College That Could," "What is Catholic About a Catholic University?" "Catholicism in Relation to Other Studies," "A Catholic University Reaches Out," and "Service to the Catholic Community." Chapters in Section II: Leadership are "The Context of Decision Making," "Presidents Make a Difference," "Leadership and Core Values," "Many Lead, One Governs," "A Developing Administration," and "Institutional Culture and Communication." Chapters in Section III: Critical Decisions are "A Study in Decision Making," "Why Business Administration?" "A New Campus is Born," "What Has Technology to do With the Humanities?" and "Religion in the Mission of a University."